I saw this guy when I stopped to buy coffee. 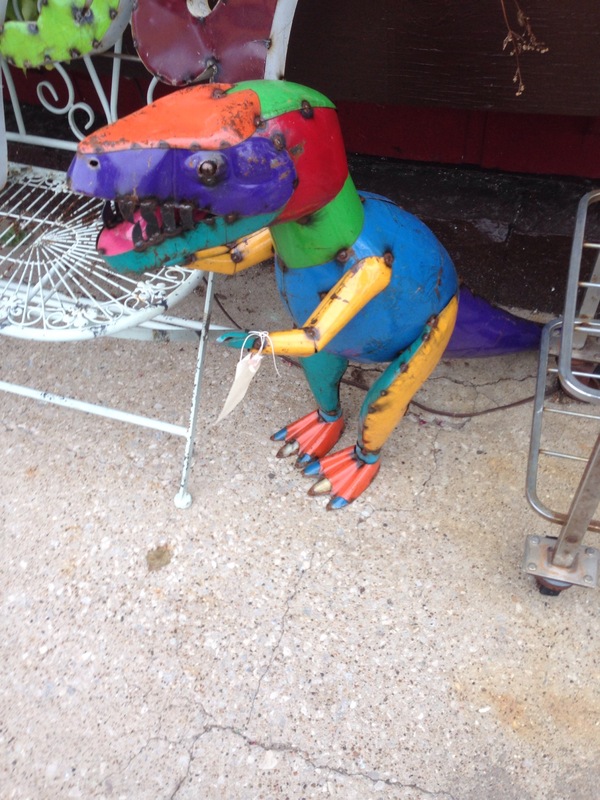 I think he would make a nice addition to my patio. The week started with my last day of work, then I flew to Iowa and spent some time with my mom. Then I made it up to Okoboji as fast as possible. The most important rule while I’m here is that I have to get in the Lake every day. So far, I’ve succeeded. Even today when it has rained all day. 15 miles was on the schedule for this weekend. I’ve never run that far by myself! So I decided I wanted to run at least 10 miles. Yesterday I set off and told Nanie I’d give her a call so she could meet me for breakfast at O’farrell Sisters. Aren’t my new shorts cool? Thanks, mom! I was questioning my plans for 10 miles when I started out. The first couple miles were tough. I felt slow, dehydrated, unsure that I was going to make it. After a few miles I was passing a woman and then she passed me so we ended up running a couple miles together. She’s done 16 marathons! Geeze! Pretty soon I’d made it 6 miles and all of a sudden felt great. Unfortunately, the roller coaster wasn’t open. I had gotten it into my head that I HAD to ride the roller coaster during the run. Sad. I kept going and eventually turned around. And then my watched died at 8.4 miles! Two weeks in a row I made the mistake of not charging my watch. Shucks. When I was about 15 minutes away from O’farrell Sisters, I tried to call Nanie but my fingers were too sweaty to unlock my phone! It took me awhile to be able to do it. Luckily I finally succeeded and about 20 minutes later found Nanie there! I mapped the run and I did about 12.5 miles. Not bad! I think that’s the longest I’ve run on my own. After a nap I was feeling pretty good so I decided I should do a couple more to get to 15. Mission accomplished. And then I jumped in the Lake. Two missions accomplished.